2018 and came and gone. The holidays are all over and we just took down our decorations about two weeks ago. Then, I realized the harsh truth that tax season is among us. Most people either love or hate tax time. It can be daunting for some of us who have to get documents organized, file before the deadline, and face the unknown fate that is our tax bill. The thing is, filing taxes doesn’t have to be such a draining experience. It can be liberating to organize your finances and dare I say, easy to file. Who knows, you may even surprise yourself and find that you are receiving a refund. 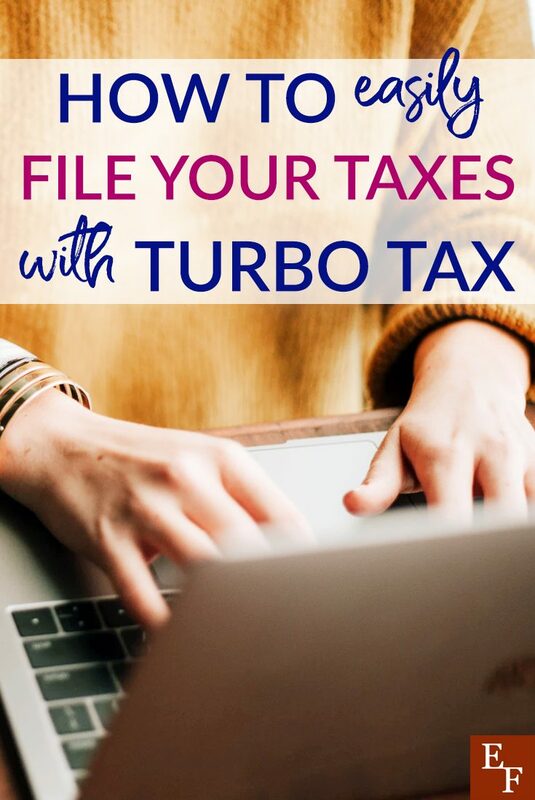 Nevertheless, filing taxes doesn’t have to be costly either because you can do it yourself with Turbo Tax. You might have heard of Turbo Tax before. It’s a #1 best-selling software system that takes the stress and guesswork out of tax time. I used to go to tax franchises and pay a tax preparer to file for me. I learned the hard way that it can be super expensive and time-consuming as well. If you’d prefer to keep more of your money, consider filing your own taxes instead. I know what you’re probably thinking: But I don’t have this expertise and I’m not an accountant. Luckily, you don’t have to be a tax expert when you use Turbo Tax. Their smart software program is user-friendly and walks you through everything. Plus, simple tax returns are free. In this tutorial review, I’ll walk you through the features, pricing, and how to use Turbo Tax to file your taxes. Turbo Tax has a few different pricing tiers but they’re all pretty affordable. Of course, filing a simple tax return on the site is absolutely free. This means you pay nothing to file your federal and state taxes if you have a simple tax return. This pricing tier is the most popular and it includes a tax filing service for people who are looking to maximize their deductions. Turbo Tax will search over 350 tax deductions and credits to find every tax break you qualify for so you get your maximum refund, guaranteed. This includes tax filing for additional assets like investments or real estate. Turbo Tax is just as secure as any other tax filing software you’ll find a CPA using. They use the latest features like multi-factor authentication, Touch ID, and data encryption to protect your personal data. Users also get access to features like login history and email notifications whenever a change has been made. Ready to use Turbo Tax to file your taxes or just want to explore their features before you make a final decision? Go to their site and click on the ‘Sign In’ button at the top to create an account and get started for free. In this initial step, you’ll be prompted to answer simple questions about your year and your situation including where you work and how you earn an income, if you have kids or a spouse, if you own or rent, and if you’ve made charitable donations during the previous year. These simple questions will allow the software to better understand your tax needs and suggest which pricing package would be best for you. The next step involves you uploading your W-2 if you are an employee, or your 1099 forms if you are self-employed. This form provides an easy way for Turbo Tax to determine how much you earned during the previous year. Once Turbo Tax has your basic information and W-2s on file, it will be easy to file your taxes with confidence and calculate your return. Their systerunsun thousands of error checks as you go so it’s a great way to double check your return before you file and send everything to the IRS. Have you ever filed taxes with an accountant or tax rep and wondered if they did their absolute best to find all your tax deductions? Hopefully, I’m not alone. Thankfully, Turbo Tax checks to make sure they locate all your qualifying tax deductions so you can see them as you file. Just be sure to answer all the questions honestly and share any new lifestyle updates whether you got married during the tax year, had a baby, etc. Getting audited can be stressful. It often means you have to go back and sort through old tax documents to provide verification and prove your case to the IRS. I like how Turbo Tax has an Audit Support Guarantee so users have access to a trained tax professional for one-on-one support should they get audited. With Turbo Tax you file your taxes electronically (e-file) and you can track the status of your tax return on the Turbo Tax mobile app. Overall, I’d say Turbo Tax does a pretty good job at streamlining and demystifying the tax filing process. Have you ever thought about filing your taxes online with a software service like Turbo Tax? What are your thoughts on Turbo Tax? I use a CPA that charges TurboTax prices (or lower): Circle CPA. Best of both worlds- expertise of a human and low cost.